Another project done! I started this one in September…. They worked up pretty fast. I tried to use as many little yarn balls that I had laying around that I could. I made the rest of the flowers, the background for the flowers and the connector rings in one night (new years eve ). They only took a few hours once I figured out what yarn I wanted to use. Now to find a place for them until I can decorate for Halloween. 3 months and nothing is finished.. 😦 but the Sugar Skull garland is almost finished! 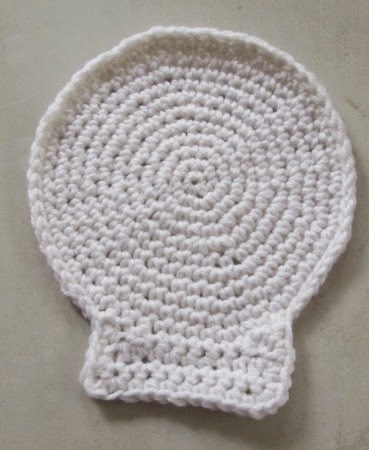 I started on the skull cap. You can see 2 skulls but I think I am a stitch off because the second skull looks a bit off center, so I will probably start over. My work in progress for this Wednesday is craft and non craft related. My work in progess for this Wednesday is craft and non craft related. 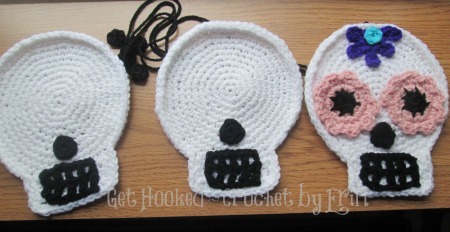 My craft related WIP is something for the Halloween season. 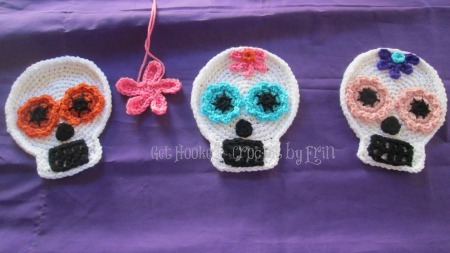 When I first saw these sugar skulls, I fell inlove. They’re awesome. And for some reason I am into skulls this year. I’m not sure where I will hang this project when its finished at this moment but I will find a spot. Now for the non craft related WIP. I recently enrolled in Writing Stories for Children through Stratford Career Institute. I passed my first 2 tests, now I have to write a scene using what I learned from my reading. I’ve been putting this off for a month.How hard can writing one little scene be? It doesn’t have to be a masterpiece, but I want to get an A for it. Lets start with an age range…. hows middle schoolers? now place…. gym class? I’ll need about 500 words. Wish me luck!